how to win more often! Ignoring the fact that my 49er heart is still heavily bleeding, I found the motivation to write down a first part of my look behind the scenes of Football’s Big Impact Cards.  Like Basketball it will be released in three parts over the coming weeks and is based on my match database I collected over the past two month which includes information about 300 matches to date. Before I start let me tell you that the stats provided after the match in BigWin Football are not really providing a lot of additional information to review the detailed impact of any card on the match because the most of them are meaningless and random anyway. For instance the biggest margin I ever achieved in points was 70 in a match my opponent (rated 12) had 37 minutes possession time. Therefore the findings in the following sections are mainly based on analysis about what cards are mainly involved for winning matches in relation to the team rating difference and based on opponents cards played. It is statistically a good system which will provide you with a card ranking of the strength and later on good combos to increase your winning percentage. Another important fact is the randomness of Hothead’s game calculating engine (luck factor) which delivers, especially for stronger teams, very often so called “upset losses”. Means, whatever cards you might play and despite the fact that your team might anyway shows a 30 or more points better average skill rating, your loss was already decided. By the way I think this happens way to often and does not support in any way 90+ teams which are happy to play three expensive Gold Impact Cards in every match. Therefore you guys who spend regularly money and Buck into the improvement of your team, maybe more appreciated customer from Hotheads point of view, will get not the fair chance you deserve by Hothead’s system. Well let’s start with our analysis and I like to remind you first that some card effects eliminate other ones played by your opponent and vice versa. Means you might end up with three cards played but no positive impact on the match. However, I have clearly identified that some counter cards do not eliminate completely the positive effect your played cards have, others do. 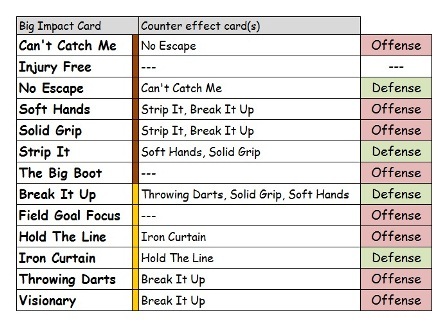 The table below lists all Football Big Impact Cards and the cards which seems to have a counter effect on it. Additionally I have included there general effect means if the card supports the offense or defense of the team. Why is it important to talk about offense and defense support? I guess the more experienced players have already realized that a combination of two offense supporting cards plus one defense supporting card gets the best results and not only in Football. If you use two defense supporting cards your results are normally lower but your winning percentage is dropping down too. Therefore I have ranked the cards divided in offense and defense supporting cards based on the impact value determined during my database analysis. Well there are just four cards in football which are supporting your defense and after analysing the results in my database the cards have been ranked using a Star Rating System. Please note that the difference in the star rating reflects somewhat the real impact just within this group. Separately listed because of it does support offense as well as defense in avoiding injuries during a game. Well considering 24 players in each team and an average injury rate observed of approximately 1 in 7 matches using the card is in my mind a waste of card slots. For all the games I watched only the matches where my Quarterback got hurt had the injury made a serious impact on the game result. It happened to me in 5 out of 312 games in the database! In this second chapter I like to present my card ratings for the offense supporting cards, which are indeed much more and it took me longer to analyse their potential value because of the large number of effect countering others during a match. However I played several PRO and AMATEUR Bowls using really strange card combos to finally confirm some statistical results. I hope this will help you somewhat to choose the cards more efficiently. Please note that similar to Basketball I could not really find a bigger advantage in using Visionary and Throwing Darts together, in fact the winning percentage and margin only slightly increased, for whatever reason. So, it might be that the effects on your Quarterback are not that strong as you might expect. OK – So far so good, the question remains can you easily just stick together the best three rated cards and be successful. Unfortunately not! Very often it is not simply possible to combine the three best cards identified and cash in all the match wins you are looking for. My database sometimes provided me with puzzling which I afterwards tried to check in playing the combos and test it against the theory. Finally I ended up with 4 combos I like to suggest. As for Basketball I chose the best combo for each wallet and all of them have proven to provide the highest winning percentage accross all opponents and counter card sets played. Don't forget that this does not mean that you will win all the games ahead but your chances are definetely improved. Suprise, surprise. For sure most of you will call me now an ignorant fool, but my choice was logical driven. I know that the same combo including Visionary or Throwing Darts will be surely the better choice but you normally need this cards in your better combos more urgently. Well, saying this and the fact that I ended up with heaps of Field Goal Focus left in my stock I tried a lot of combinations to find a useful combo to use it. And here it is. Despite the fact that I normally prefer to play with two offense and one defense card this combo works amazingly well for same or lower rated opponents and you can use FGF which is really terrible in the most other combos. Therefore try it and judge on your own. Can't catch me again worked very good and provided good winning percentages together with BIU and TD. This combo worked slightly better as for instance Visionary as replacement for TD and Iron Curtain taking the spot of BIU. Therefore according my database the best combo for moderate budget. Your feedback is always welcome - Just post it in our Forum!